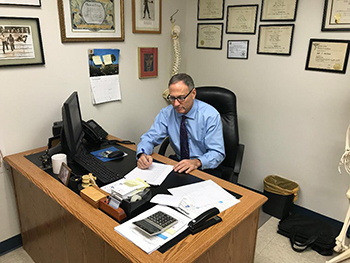 Dr. Jeff J. Mollins, Brooklyn’s premier accident specialist, has been diagnosing, treating, and documenting injuries sustained by individuals hurt in accidents (automobile, slip and falls, work accidents, construction accidents) for 30 years. Dr. Mollins works very closely with a group of referred medical specialists to provide comprehensive care to his injured patients. One of the medical specialists that Dr. Mollins works very closely with (to provide quality, comprehensive care) is a Physiatrist. A Physiatrist, otherwise known as a doctor of physical medicine and rehabilitation (PMR), specializes in a wide variety of treatments for the musculoskeletal system (the muscles, bones, and associated nerves, ligaments, tendons, and other structures) and the musculoskeletal disorders that cause pain and/or difficulty with functioning. A Physiatrist’s treatment focuses on helping the patient become as functional/and pain-free as possible in order to participate in and enjoy life as fully as possible. Physiatrists treat a wide range of problems that affect the musculoskeletal systems. The following is a list of back conditions commonly treated by Physiatrist’s. Physiatrists diagnose injuries and problems of the musculoskeletal system by taking a thorough medical history of the injured patient and performing a complete physical exam. Further diagnostic testing may include laboratory testing, x-rays, MRI scans, electromyography, and nerve conduction studies, as well as possible psychological testing. Passive physical therapy (modalities, such as ultrasound or ice or heat to relieve the pain). As always, all of Dr. Mollins’ referred medical specialist (including our Board Certified Physiatrist) are Workers Compensation Certified. This means that if you are injured on the job, you can be treated at no cost. If you are unable to work, you can be compensated for your lost wages and when you return to work (hopefully) you can still receive treatment at no cost.